Forecast July 15, 2012 – July 21. I have an image in my mind of an ocean shoreline. There are large rocks in the water. Waves pound against the sand. The wind enjoys the unfettered space. I settle more fully into this vision; imagining the sounds and smells, I arrive more fully there. On this shore when the tide is low, tidal pools are exposed between the rocks, which are teeming with life. When the tide comes back in, they disappear under the waves. This is a landscape of rhythmic flow, fertility, nurturance, and hidden life. Until the New Moon in Cancer on July 19, this landscape provides a good metaphor for considering our intentions for the upcoming lunar cycle that begins then. My favorite metaphor for Cancer is this shoreline. It helps me to understand what really drives this sign. It seems to me Cancer’s depiction is often oversimplified in a way that just doesn’t do justice to this complex sign. I use this shoreline metaphor to better understand the gifts and needs of Cancer. The middle of the ocean feels more Piscean to me, but Cancer is about the shore—that boundary between substance and feeling, the fertile place of tidal pool, sea life, and the rhythm of wave in the ebb and flow. These things speak to me of Cancer. Some qualities of Cancer to notice as we prepare for this New Moon. The wave on the shore. Cancer is a Cardinal sign, and as such, needs to make an impact on its environment as the wave shapes the shore. The tidal pools, which become the nursery for so much diversity of life. Cancer provides the environment for life to be nurtured. It is a fertile sign that pays attention to what is needed for sustenance. The easily changeable ocean, going from calm to tempestuous in an instant. Cancer has a strong feeling nature, which can shift quickly too. These fluid emotions can range from compassion and concern for others to reactivity and defensiveness. The powerful force of wave. When this sign feels a need to act, protect, or defend what it holds dear, Cancer has incredible strength. The ebb and flow of tides, which are a key metaphor for Cancer’s innate wisdom of knowing when to push forward and when to retreat. If this emotional intelligence is honored, Cancer teaches us how to sense what is really needed in any moment. So, thinking about your own shoreline, what is the state of your ocean? What intention do you wish to set for this New Moon? Home is important. Is your home sustaining you or are you depleted by the demands of tending your hearth? Are you at low tide or high? What changes do you need to make during this cycle to support what best feeds you so you in turn may feed others. Take your emotional temperature. What do you need for balance? Cancer is one of the four cardinal signs being strongly impacted by the Uranus/Pluto square right now. It is not surprising if we find ourselves submerged in whirling pools of emotion as we grasp for a sense of safety and security. Sometimes the best work we can do is to forgive ourselves for succumbing to these very natural feelings of fear and anxiety in a changing world. When we develop compassion for ourselves, it is much easier to extend that compassion to others. Sunday, July 15. The old waning phase of the Moon has a tone of oceanic surrender to it. It is appropriate today, to spend some time in relaxation and reverie to prepare the way for the next lunar cycle. Mercury just stationed retrograde in Leo the day before and we feel this shift in consciousness. Mercury, the god of doorways is holding open a space for us to learn new ways of perceiving. Sometimes we can feel frustrated by this shift, wanting to keep things the way we like them. If you feel frustration today or during the next three weeks of retrograde motion, take a moment to notice that pattern and see if you can let go of rigidity around it. We benefit from becoming more flexible. Monday, July 16. As the Moon enters Cancer this afternoon* the real deepening into the dreaming of the New Moon begins. Begin to notice your own emotional state and those around you. What is really needed at this time? Open and receive. Tuesday, July 17. A crossroads represents a time of choosing—four directions, four choices. Sometimes it can feel like no matter which direction we choose to go, there is a hard road ahead. Today might feel like that. Four planets in the four Cardinal signs create a Grand Cross today. This configuration of planets represents a need to find our still center in the midst of potentially stormy events. It is only from the center that we have any choice at all. In this cross are: Mars in Libra, Uranus in Aries, Pluto in Capricorn, and the Moon in Cancer. To say we may be pulled in multiple directions today is an understatement. We may also experience unexpected bursts of anger, fear, and/or impatience. New shifts in power are quite possible. The New Moon is approaching and with it an opportunity to set a new intention for the next month. What are you discovering about your intention today? Wednesday, July 18. If the fuel for a fire was set into place yesterday, today may be the spark that sets it ablaze. Mars opposes Uranus today encouraging a release of pent up energy. Uranus blows a horn to wake us up. Mars may be trying to hold things in balance, but even in the sign of Libra, Mars sometimes has got to let loose. The question today: Am I ready to wake up and live a life of authenticity and empowerment? Today is not a day to take the backseat on the road to the future. What do you want to do? Will you begin it today? 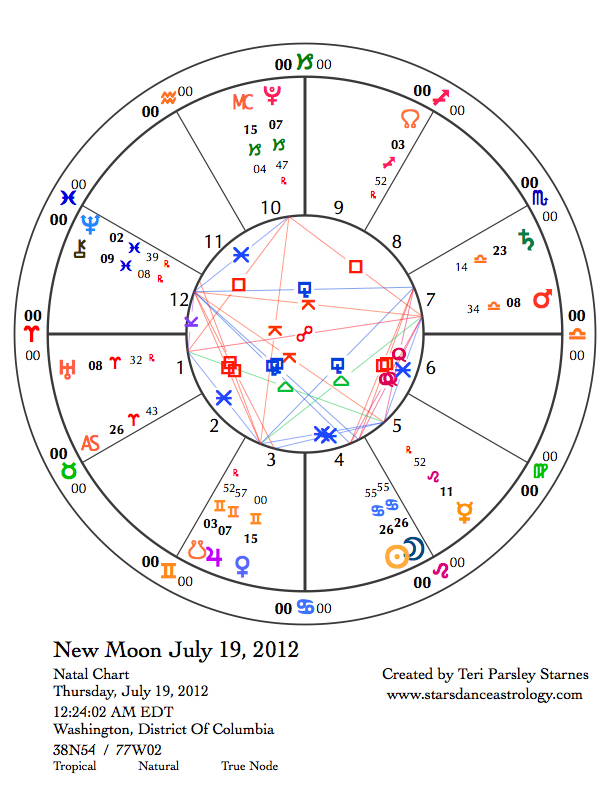 July 19—New Moon: Dreaming In the first half hour of this day, the New Moon at 26° Cancer occurs (EDT). The Sun has only three more days to be in Cancer. Before it leaves this sign, we take a moment to remember our deepest selves—the shoreline of Cancer’s ocean. Know what truly matters to you, because Cancer touches on those places of deep need. After the excitement of the last two days, we return to the grounding we need to manifest our dreams. The Sun and Moon square Saturn today. It may not feel entirely good, but we want to act responsibly and have something real to show for our emotional experiences of this week. 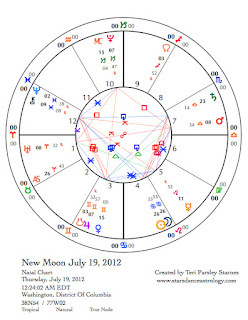 The chart for the New Moon shows that the challenging relationship between Mars, Uranus, and Pluto are still very much in effect and still very much part of our New Moon possibilities. We can use this energy to try something new; to uncover toxic secrets; act for justice; take a risk; dare to be powerful … What if this lunar month were an initiation? Would you accept the challenges in order to grab onto this potential? Another configuration presents intriguing possibilities as well. There is a Yod (or Finger of God) formation pointing to Chiron in Pisces. This triangle has as its base a sextile aspect between Mars in Libra and retrograde Mercury in Leo. The theme of initiation applies when Chiron is emphasized. Perhaps the test will be to sacrifice the ego in order to find the ego’s true purpose. Each of us has a unique gift that the world really does need. What holds you back from that gift? What if it takes letting go of it before you can find it? Friday, July 20. How do you feed your fire? By this I mean that internal spark of creativity and joy. Fires need to be tended, given the right fuel, enough air to breathe. If we are feeling depleted, it is good to pay attention to our fires of self-worth. Today is a good day to do this. Have fun this Friday night and pay attention to what truly nurtures your heart flames. Saturday, July 21. This is a good day to get your house in order. With the Moon in Virgo, we feel a need to create more order in our lives. It doesn’t have to be obsessive. Is there a pile of papers on your desk that need to be sorted through? Or perhaps a new organization system for a closet, or just sweeping the floor? Notice the difference in your spirit when you do simple tasks today. Jupiter and Uranus are connecting in a delightful way today also. We see the positive side of change. Expect new insights, feed your sense of curiosity, and push past old limiting beliefs. The horizon opens up! Detailed information indeed. Astrology facts is very much explained. I am now a fan of your blog.